Designing and capturing a color scheme for a digital media composition is an important step in the creation pipeline. Whether it is an immersive experience, animation or visualization, color selection is key to conveying the message or story. In this panel, we assemble a group of color experts, aka "Color Mavens", to convey and define color appearance and colorization methods. Each panelist represents a particular color advice approach whether it includes a recommended set of guidelines for color appearance, suggested color schemes, a tool for color capture, an application for color palette creation or tips from colorization experiences. Each panelist will highlight their methods with a team discussion about optimal colorization approaches to follow. The panel will also identify gaps in our understanding about the use of color in digital media composition as well as identifying future application and research directions. We introduce an extremely scalable and efficient yet simple palette-based image decomposition algorithm. Given an RGB image and set of palette colors, our algorithm decomposes the image into a set of additive mixing layers, each of which corresponds to a palette color applied with varying weight. Our approach is based on the geometry of images in RGBXY-space. This new geometric approach is orders of magnitude more efficient than previous work and requires no numerical optimization. We provide an implementation of the algorithm in 48 lines of Python code. We demonstrate a real-time layer decomposition tool in which users can interactively edit the palette to adjust the layers. After preprocessing, our algorithm can decompose 6 MP images into layers in 20 milliseconds. 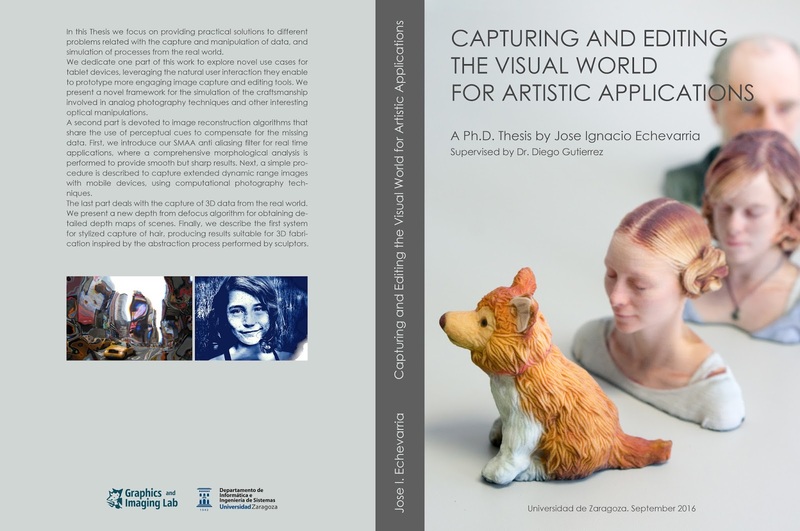 In this Thesis we focus on providing practical solutions to different problems related with the capture and manipulation of data, and simulation of processes from the real world. We dedicate one part of this work to explore novel use cases for tablet devices, leveraging the natural user interaction they enable to prototype more engaging image capture and editing tools. We present a novel framework for the simulation of the craftsmanship involved in analog photography techniques and other interesting optical manipulations. A second part is devoted to image reconstruction algorithms that share the use of perceptual cues to compensate for the missing data. First, we introduce our SMAA anti aliasing filter for real time applications, where a comprehensive morphological analysis is performed to provide smooth but sharp results. Next, a simple procedure is described to capture extended dynamic range images with mobile devices, using computational photography techniques. The last part deals with the capture of 3D data from the real world. We present a new depth-from-defocus algorithm for obtaining detailed depth maps of scenes. Finally, we describe the first system for stylized capture of hair, producing results suitable for 3D fabrication inspired by the abstraction process performed by sculptors. I recently worked in a short documentary with some colleagues from the Graphics and Imaging Lab, aimed mainly to showcase the general public the state of the art of some subfields of computer graphics. It was recorded entirely in spanish, with subtitles in additional languages available in Youtube. Human beings, as visual beings, have leveraged different tools through history to communicate visually, often through works with a strong creative and artistic component. In this area, the arrival of computers has meant a revolution, providing new media for their broadcasting and creation. But in contrast to other tools, computers keep getting more powerful and more capable… Will they one day be able to create art autonomously? dimensions. We propose a new decomposition algorithm that jointly optimizes the whole light field data for proper angular coherency. For efficiency, we extend Retinex theory, working on the gradient domain, where new albedo and occlusion terms are introduced. Results show our method provides 4D intrinsic decompositions difficult to achieve with previous state-of-the-art algorithms. We further provide a comprehensive analysis and comparisons with existing intrinsic image/video decomposition methods on light field images. © Cheve 2010-2019. Powered by Blogger.